The United States should calculate the speed and range of the latest Russian weapons before taking action. America’s time to leave illusions about gaining global military superiority. This was stated by Vladimir Putin in his message to the Federal Assembly, noting that Russia’s actions are defensive in nature. Work on the hypersonic Zircon rocket, capable of speeds up to 9 max, goes successfully and will be completed on time . This was stated by Russian President Vladimir Putin during the annual message to the Federal Assembly, which became his 15th head of state. At the same time, the Russian leader ruled out the possibility of deploying missiles in Europe. However, if this is done by the United States, Russia will take “mirror and asymmetric” measures, he assured. 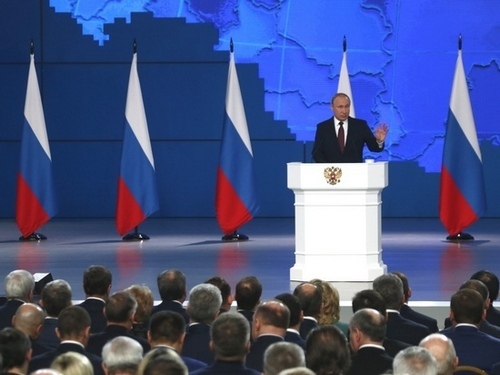 Putin urged the United States to calculate the speed and range of the latest Russian weapons , before acting, and leave illusions about global military superiority. In this case, the actions of the Russian Federation, said the head of state, are defensive. The Russian leader also said that in order to protect the national interests of the Russian Navy, seven new multi-purpose submarines will be handed over and in the near future five surface ships will be laid in the far sea zone. Next spring, the first nuclear submarine with the Poseidon unmanned aerial range of unlimited range will be launched, and its tests are successfully completed . Commenting on the situation with the INF Treaty, Putin acknowledged that the agreement on the elimination of medium-range and shorter-range missiles signed in 1987 is outdated. However, according to the Russian leader, the United States should not have used far-fetched pretexts to exit it, blaming Russia. – Washington itself violates the terms of the contract, looking for the perpetrators, and makes its satellites “pogruyukivat . ” The United States had to honestly explain its withdrawal from the INF Treaty, ”Putin said. Earlier, US President Donald Trump announced the possibility of concluding a new treaty to which China could join. But the Kremlin questioned the implementation of this initiative.